February 3, 2016, is the day four All Saints’ seniors will never forget. 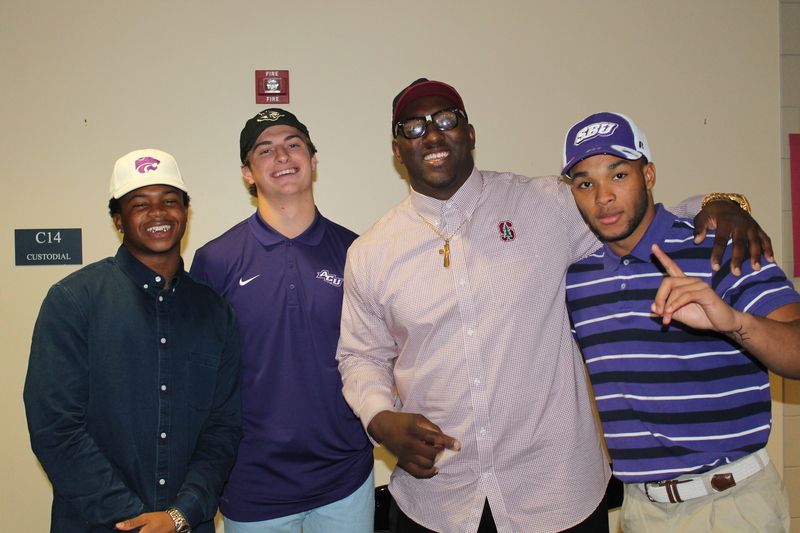 On this day Luke Anthony’16, Isaiah Harris’16, Quincy Jones, Jr.’16, and Michael Williams’16 signed their life away, or at least the next few years, to four lucky universities. The ceremony began shortly after 8:20 a.m. with a prayer from Mother Benko. Dr. Thaddeus “Tad” Bird gave a quick congratulations to the men then passed the floor onto Athletic Director and Head Football Coach Aaron Beck. Coach Beck started off by saying “we’re going to make some noise this morning,” and sure enough, the Upper School was filled with lots of noise and applause all morning. Coach Beck followed alphabetical order meaning Quarterback Luke Anthony was up first. Anthony transferred to All Saints’ his junior year from Highland Park to be the Saints’ starting quarterback his senior year. Beck mentioned how Anthony has shown his commitment to the All Saints’ program and sport by driving to and from Dallas everyday for practice/class. Anthony was a team Captain during the 2015 season and accumulated over three offers over the course of the season. 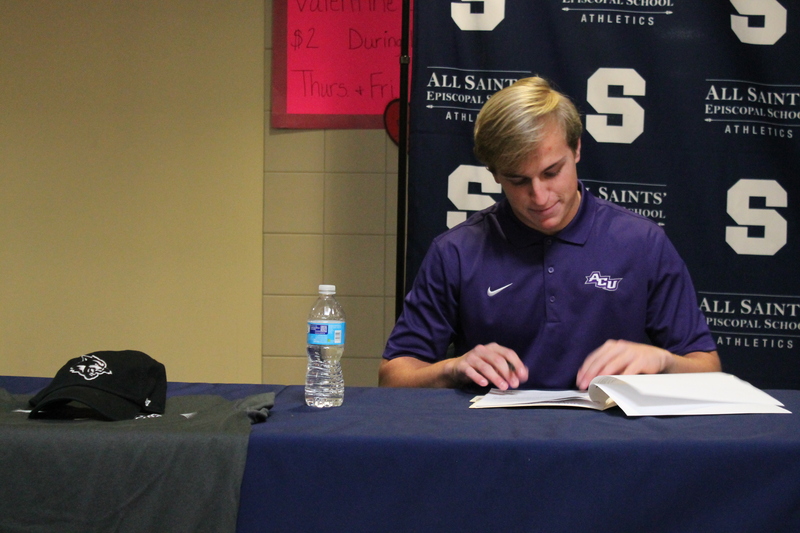 He eventually chose and committed to Abilene Christian University. ACU is one lucky school as Anthony has been training with quarterback coaches almost everyday over the past week in preparation for college ball. Congratulations Anthony, and Go Wildcats! Isaiah Harris drew Beck’s attention next. It was apparent from the get-go how close Beck and Harris are as Beck exchanged a little banter about Harris being late to his signing day. Harris is a three-sport athlete for the Saints’, but his heart’s in football. Like Anthony, he was also a team Captain for the Saints’. Over the course of his time playing for the Saints he accumulated 34 touchdowns (rushing and receiving) and won three SPC Championships. Beck said he feels like he almost doesn’t need to coach Harris when he’s on the field because he’s an athlete and will make a play no matter what. 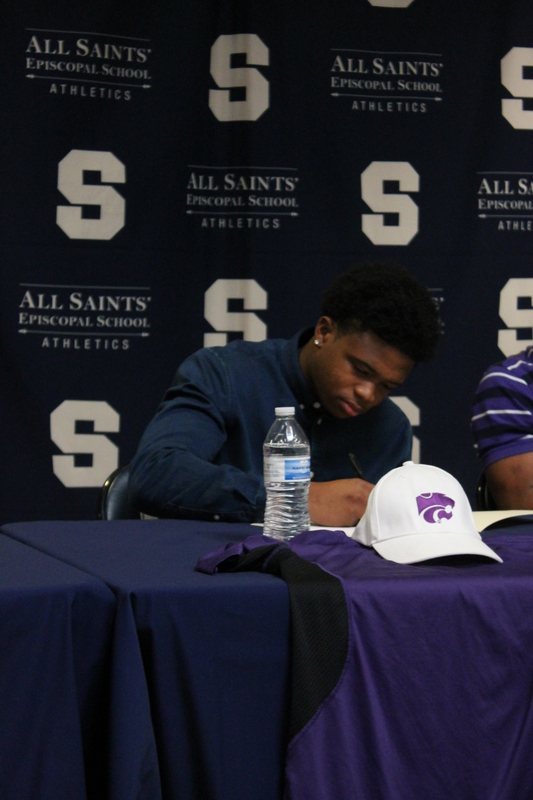 Early into his senior year, Harris chose to commit to Kansas State University. 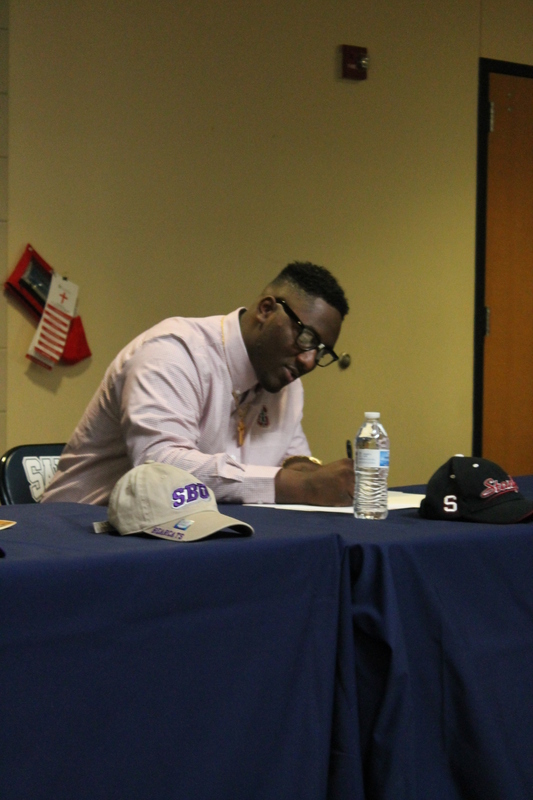 He received six other offers from schools like Army and the University of Houston. Congratulations Harris, and Go Wildcats! Quincy “QJ” Jones was up next. Beck quickly drew attention to Jones’ personality on and off the field. Beck said he doesn’t need to ask if Jones is on the field, all he’s got to do is listen. Jones matches Harris when it comes to being a three-sport athlete; however, Harris and Jones differ in the way they committed. 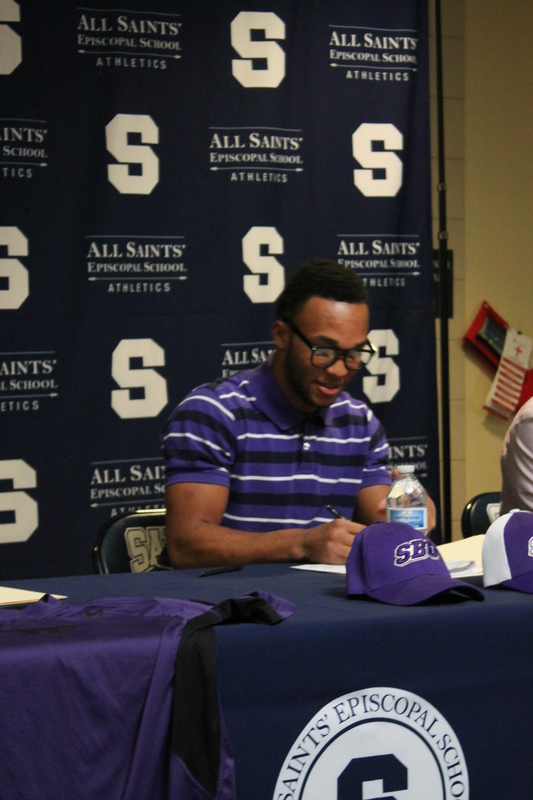 Jones took a visit to Southwest Baptist University after the season ended and immediately knew that was where he wanted to play. He announced his commitment the night he visited, and looks forward to playing for the Bearcats in the fall. Congratulations Jones, and Go Bearcats! Last but not least was two-sport and four-year football letterman Michael Williams or “Big Mike.” Beck immediately called attention to the grill Williams had in his mouth (Harris had one as well) by asking him to smile big, but failed to mention the nose-taped glasses he was wearing. Why was Williams sporting the unique eyewear? Simply because he chose to join Stanford University’s signing class of 2016. Williams totaled 205 tackles and 11 sacks over the course of his four years; however, in Beck’s eyes, his greatest accomplishments came in the classroom. Stanford requires students to get admitted without athletic intervention, so Williams had some high standards to meet during his senior year. Instead of taking the easy way out and committing to one of his other 40+ offers, like the University of Michigan and the University of Texas, he buckled down to ensure he was admitted into Stanford. Congratulations Williams, and Go Cardinals! The morning ended with a big round of applause for the four athletes. The All Saints’ community is very proud of them for what they have done on and off the field. Good luck boys at the next level!